You keep seeing this message *** System Restart Required *** when you log in to Linux. In this article we will see what updates have triggered this message and how to apply them. This message indicates the presence of the file /var/run/reboot-required. Ubuntu packages can trigger the creation of this file in their post-installation script postinst. A restart is usually required when an update to the Linux kernel has been installed. These are often security patches that only come into effect after reboot. Above we can see there is a Linux kernel security update linux-image-4.4.0-92-generic and linux-base, which requires a system restart. You typically don’t need to restart right away, but you’ll be vulnerable to any security problems fixed in the new kernel until you do. This will show you the last 100 packages installed. Important updates to the Linux kernel typically begin with linux-image-. If you just want to get rid of the ***System Restart Required*** message without restarting, you can remove the reboot flag file. I agree, server reboots should always be attended in case of failure. Which version of Linux are you using that restarts the server automatically? Very nice detailed article!!! THANKS! If the update-notifier-common is installed, Ubuntu will alert you about pending updates via the message of the day (motd) upon console or remote login. Thanks. I may work that into the article. How exactly does a package trigger this message after install? Inside some .deb files (installation packages) there is a post-installation file called postinst, which is run after installation. The shell script /usr/share/update-notifier/notify-reboot-required updates /var/run/reboot-required and /var/run/reboot-required.pkgs. This last file contains a list of packages that requested a reboot. After I restart I still get “packages can be updated” message? You may need to run sudo apt-get update, sudo apt-get upgrade and sudo apt-get dist-upgrade to update all your packages. 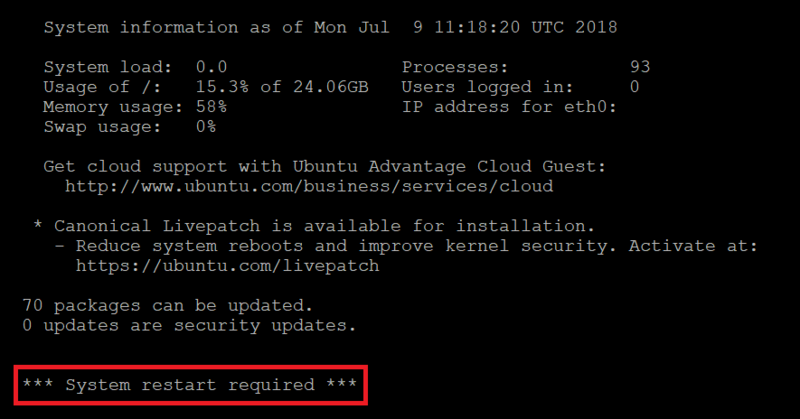 Please see article: How to update Ubuntu in terminal.